Jury Pay has been a minimum daily $10 plus mileage since 1968. Government and some private employees get their full salary while serving, but the daily $10 is a hardship for others. In 2013, with a Republican co-sponsor, I proposed a bill to allow counties to pay up to $50 a day, which passed, but only a few counties do so. Just think about how much County Commissioner, Judge, and attorneys pay has increased since 1968. In 2015 I proposed a bill for $50 a day financed in part by court fees, which passed the House but stalled in the Senate. 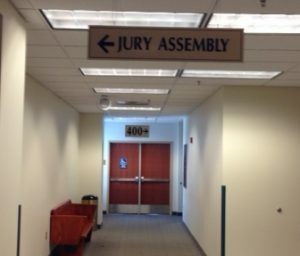 Jury service is probably the only public service mandated by government. I want to work again next session to pay $50 a day. What do you think and what is your experience? 4 Comments on "Jury Pay"
$50 a day sounds reasonable to me and would perhaps reduce some of the resentment and cynicism many people feel about being called to serve on a jury. I support your efforts. I think this is entirely appropriate. Even as a substitute teacher in a couple of school districts around here I received more than $50.00 per day. It seems to me that if a person is going to be paid anything at all for doing this public service, and since the service is mandated and can typically last at least a week (at least in my experience), that $10.00 per day is a silly and even disrespectful compensation. It wouldn’t even pay for babysitters for those who need them nor adequately compensate for lost income by any stretch of the imagination. I could not agree more, John. While my own experiences were as a state employee and I lost no pay, I can’t imagine how hard it would be for, for example, a stay-at-home mom who’d have to arrange child care. No way is $10 going to cover that.